When it comes to credit counselling, there is no single program that can be said to be the best debt consolidation service. The reason is that people do have different debt situations, financial goals and assets and personalities. In short, if a particular debt service was good for someone, it may not necessarily be good for another person. However, there are certain things you can do to get the most appropriate service for you. Before getting into that however, it is important to know some terminologies. This refers to the lumping together of multiple debts and then settling them off as a single payment. It could be that you have several debts like medical bills, credit cards and bank loans. When you consolidate these debts, you will need to only write one cheque to your debt management company. Your company then distributes the payment among the several creditors you owe. This refers to a situation where a third party will attempt to agree a lower interest rate for the loans you owe on your behalf. Debt settlement is where a third party, especially your debt consolidation company, negotiates lower principal balance regarding your current debts. No one chooses to remain behind in their payment schedules. Most of the time, people are forced into it. The following are some other reasons that may make an individual to default in debt repayment. The ever rising cost of living is making life very hard for many people, thus they find it difficult to service all of their debts. A person will only service a debt after ensuring that he or she is able to meet the needs of his or her household, such as food, rent and school fees among other things. The second reason is the high interest of credit card debts. This is really eating into people’s budget especially because they want to settle the debts but are not able to get bank loans. Also, most defaulters just keep themselves afloat by utilizing a line of credit. In order to be guaranteed of getting the best services from these companies, you need to begin by choosing the right debt management company. The following are the things to consider when going for the most appropriate organization. The fact that an organization indicates on their website that they are non profit does not guarantee that they actually are so. The surest way to know this is by insisting on seeing their not for profit certification. This way, you will be able to tell that a company is really a non profit one. Most people think that because an organization is a non-profit one, no fee is required. Remember that these companies also need to run. However, their fees will be considerably lower than the for-profit companies. This is because they do get funding from local organizations as well as credit unions. Another trick that unscrupulous companies use to ensnare unsuspecting public is by claiming to be affiliated with a certain religious faith. This is to imply that you should not take a company to be reputable just because you are able to see the name of your faith there. It may appear utterly unspeakable, but the truth is that scam companies can do virtually everything to manipulate you. Merely bailing you out of your debt situation is not enough. One thing that defines best debt consolidation services is credit counselling. In fact, all non-profit debt management companies are required to meet this fulfillment in order to be deemed as so. The importance of credit counselling is that it helps you avoid getting steeped in debts in future. Actually, this is a very important component of a good debt elimination plan. If you are using the internet to search for information regarding the best debt consolidation services, you need to read their online reviews. The reviews contain what people feel about it. These people have worked with the company, and so they will just be sharing their experiences. If you find bad reviews about it, then you should not expect to get any good services from it. The financial shackles are on and have been for quite some time now. You can feel them as they’re a part of you now, sinking into skin. They’re tight and all too familiar; constricting and uncomfortable are two words that come to mind. You’re considering to break free, merely just to give your wrists some breathing room, but more importantly, to alleviate the pains of your outstanding credit card debt. Know this – you’re not the only one attached and imprisoned by overwhelming credit card debt. Nationwide, many an American is unwillingly tied down to their credit card debt. Yet, oddly enough, for some reason, many of these individuals still seem to find a way to deal with, even embrace having such a connected debt relationship. But, why does this happen? Why does this complacency prevail instead of a desire and following action to break away, to disconnect from credit card debt? Reasons here are many, but primarily, feelings of just dealing with -and not alleviating – painful debt and breaking the corresponding shackles are due to being utterly overwhelmed. Americans in general spend in a plastic fashion and quite excessively. Overtime, they spend way beyond their means, and lose track of their fast-track plastic spending status. The result is a debt cluster, an accrued pile too immense to even comprehend. Thus, many will just sit on the mound of debt, frown for a while, maybe scratch their brow in befuddlement and in the end, simply give up as they begin to sink into and eventually become part of the mountain of debt. Being buried under a heap of credit card debt though is not something you should be content about. You’re doing yourself, not to mention your creditors, a complete disservice. Debt won’t just disappear, so why should you? Why not use your fingers to pierce a hole out and let some light into that mountain of debt? It’s certain once you see a bright financial solution on the outside, you’ll be riled up enough to jump up and outward, freeing yourself of being covered by credit card debt. Through peering out that little hole, you can see a financial light of hope. What you’re seeing is no holy visage. You’re seeing the glimmering alleviator, the financial way out commonly known as Credit Card Consolidation. “What’s this all about?” you might ask. Well, for one, it’s the answer you’ve been idly seeking. And secondly, it’s a light you should embrace. With such a financial motion as credit card consolidation any and all credit card balances, namely ones with considerably high amounts, will be gathered together and organized to provide you structured payment options. These options are outlined in a fashion to cater to your currently weak financial position, but more importantly, to assist you in paying off all your credit card debt for good. Consolidation here can very well lead to complete credit card debt freedom, provided, of course, payments are delivered in a timely and continual basis on your end. So, let that mountain of debt crumble by accepting the light of consolidating, let it fall and become dust. Let bits of debt blow away. Chiefly, you’ll gain a mental calm and sense of clarity. Benefit comes though peace of mind and it will come simply through you’re newly attained consolidated monthly payment format – a payment occurring once each month. If you have decent credit, you’ll also be able to negotiate a lower interest rate on which you pay to your desired company until your credit card debt consolidation venture is finalized. Overall, what’s handed to you here is control in an organized, financial company-provided fashion. Consolidating here allows for personal financial power, but more so, responsibility. If conducted with intent to erode that once towering mountain of debt away, consolidating your credit card debt will prove all too rewarding in the end, as your life will finally be – and thank goodness – credit card debt-free. These are some latest information about credit card consolidation and few techniques about that. These techniques will help you to get free from credit card consolidation. Canada is one of the lucky countries in the world that have a high per capita income. However, some people who take too much credit card debt and loans fall into liability for not being able to repay them. If you are one of these people and you find that your credit rating is drifting from good to bad, you need to seek debt help. 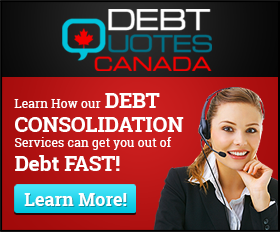 Debt Quotes Canada can help you sort out your financial problems and clear your pending dues. They can provide you with credit repair and money management counselling and help you reduce your interest payments on outstanding loans. Debt consolidation services are designed to help you regain financial control. There are many debt consolidation services offered by debt consolidation firms. They include credit counselling, debt management, debt settlement and consolidation loans. Debt consolidation loans and debt settlement are not ideal because they may not help you get reprieve if your debt load is much greater than you can manage. Consolidating debt through credit counselling involves a range of services including suggested solutions to help you deal with serious debt problems and advising debtors. Debt management programs can make informal arrangements with your creditors, consolidate your debt into a single payment and in serious situations, the company can recommend that you declare bankruptcy. Debt counselling firms may operate on a for-profit or non-profit basis. The main difference between these firms is their fees structures, the services they offer and the experience and expertise of their staff members. Some non-profit credit counselling companies claim to have lower fee’s than for-profit credit counselling firms. However, for-profit debt counselling firms in Canada tend to have more qualified staff. Either type of debt counselling service provider will help you get out of debt in the most effective and fastest way possible. The debt counselling process involves consulting with a credit counsellor where the professional assesses your financial situation and provides you with a report outlining your credit rating. The credit counsellor will then inform you what you need to do to deal with your debt. Debt Quotes Canada can assist you by setting you up a credit management program that restructures your loans under a debt counselling arrangement. In this arrangement, the debt counsellor will negotiate with your creditors convincing them to take much less in interest fee’s and charges in return for guaranteed payment. The debt management service provider will then arrange a payment schedule that you can easily afford to pay over a certain period of time. This process will help you consolidate your debt into a single payment with the end goal being to pay off what you owe and get a clean slate. Debt counselling services can help you significantly reduce the high interest rates of credit card debt to make it easier for you to pay off your loans. Using debt consolidation services is also an effective way to reduce or totally eliminate harassment from debt collection agencies. Your credit counsellor will speak directly with these agencies and ask them not to call you anymore. Debt counselling service providers can also win over lenders to approve your new credit applications. Apart from helping you consolidate debt, credit counselling specialists can also provide you with financial management advice and budgeting tips. This may include teaching you how to use the money you earn to pay for basic necessities, encouraging you to save more and helping you create a practical budget. With these services, you can form an approach or plan that will help you avoid getting further indebted. Most good debt consolidation service providers offer free quotations for their services. You should take advantage of these quotes to check out the options you have, the terms of payment and interest rates before you commit to working with a particular service provider. After consolidating your debt, you will make a single payment on a monthly basis to the credit counselling company. The company will then make regular payments to your creditors. Debt counselling services allow you to solve your financial problems in straightforward manner. You just have to be committed to paying off your debt and work with a trusted debt counselling company to surface out from your unbearable financial circumstances. You can choose a long term or short term debt payment option. Debt Quotes Canada can set you up with a free debt consultation and a free quote to help you get back on the right track. Speak with one of the Friendly Professionals to learn how to Consolidate Your Debt and avoid bankruptcy.